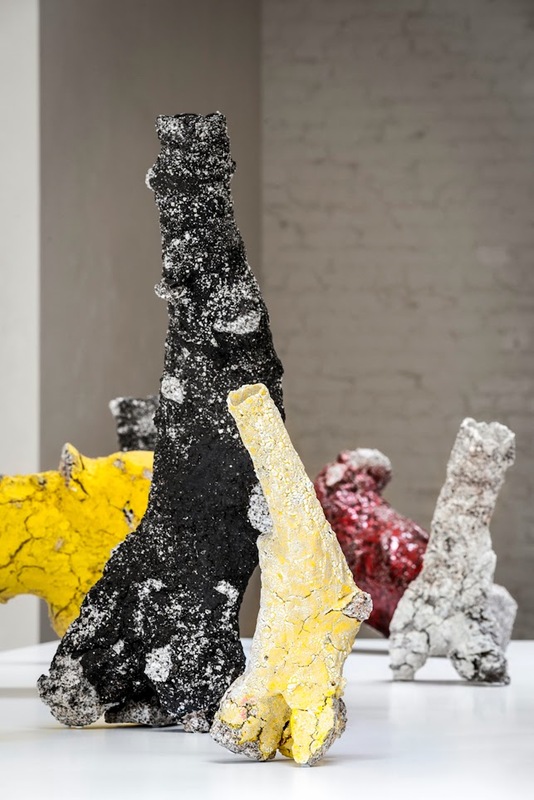 Where I come from...." - Real Estate's "Atlas"
"Inspired by the anthropomorphized natural rock outcroppings of polish legends from her childhood, Aneta Regel Deleu’s asymmetrical, abstract ceramic forms evoke a curiosity from her viewers, and allow the opportunity for a philosophical reflection; the heavily grogged clay and unprocessed volcanic rocks play the role of the natural elements with almost a granite-like texture, while the colored glazes, demonstrate a constructed order of human existence. Aneta developed and refined her sculptural ceramic and glazing techniques, which she acquired during her time at the Royal College of The Arts in London, to create the vivid and witty forms that highlight this dynamic tension between the unglazed natural world and the powerful finesse of the human world. Aneta Regel Deleu’s work has been acquired by such institutions as the Westerwald Museum in Germany and the World Ceramics Museum Icheon in Korea. "